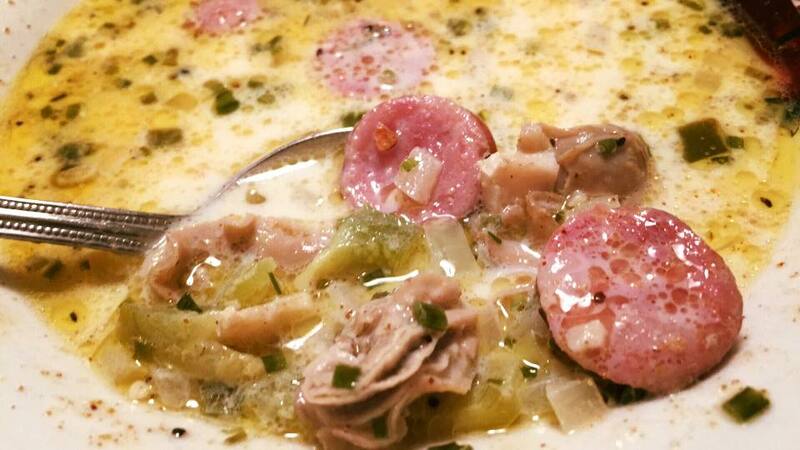 Chad Gillikin’s Oyster and Sausage Stew (Photo courtesy of Judy Gillikin). Your Oyster Recipe of the Day: Chad Gillikin’s Oyster and Sausage Stew. The Oyster Obsession Facebook group recognized this recipe was a winner at first glance. Judy Gillikin posted the picture of her husband’s oyster stew and it received 50+ likes in hours. One look at that buttery broth and I was asking for the recipe. Chad and Judy graciously shared it! The Gillikin’s live in oyster country, along Florida’s “Forgotten Coast,” so they know a good oyster dish. Chad’s traditional stew gets a boost of smoky flavor from thin sliced andouille sausage. Melt butter in a dutch oven over medium heat; add onion, bell pepper, celery, sausage, and Pro-Boil and cook, stirring occasionally, until vegetables are translucent. Add oysters and reserved liquor, simmer until oysters begin to release juice. Stir in milk. Heat just until the stew comes to a light boil. Turn the heat off and let it stand about 30 minutes to blend the flavors. TIP: Chad shucks fresh oysters over a strainer to catch every drop of delicious oyster liquor. TIP: Don’t overcook your oysters! As soon as the stew comes to a simmer, turn off the heat. Find scores more hearty oyster stew recipes (plus oyster soups, oyster gumbos and more) from your favorite chefs, magazines, food blogs, and cookbooks.